Air sign triplicity (Libra, Aquarius and Gemini) respond to situations by putting the puzzle together first. This may mean adapting to what they think others would like of them. This gives the the illusion of emotional aloofness and detachment as a result but that is not the case. Ultimately their response to any emotional situation is in the diplomatic theater rather than the gut reaction. The Aquarian Moon native is loving and loyal in relationships. They have the uncanny ability of being sympathetic without being sentimental or effusive. They are rather obtuse to the moods of others, not because they don't care, but rather their focus is elsewhere. Idealistic, optimistic and friendly, they are broad-minded and liberal in their regard of people in general. Social animals that they are, they attract friends and acquaintances from all walks of life. They are not likely to have only one MAIN relationship in their lifetime. As far as they are concerned "the more the merrier". 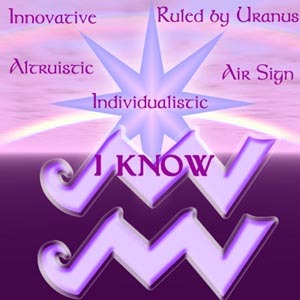 This Air sign is emotionally stable albeit at times can be eccentric in actions as viewed by normal conventions. They have an innate ability to be a calming influence around those who may be having emotional distress. When they themselves are distraught they voraciously clean the closet or attend to a major project to work the dis-ease away. It is unlikely you will find an Aquarian Moon personality rushing into an emotional commitment. They have to hem and haw for sometime, overanalyze it and then commit. Once they make a commitment to an idea, project or relationship, they stick with it. Strong individualism and an eccentric nature can make marriage difficult if the partner is not of an alike mind. High maintenance relationships are not something you would find a person with Moon in Aquarius engaging in. Freedom of their own self expression will be the prime concern. When it comes to social conventions and taboos, Aquarian moons usually seek to disprove or test them. Famous Aquarian Moon Women: Anne Baxter, Charlotte Bronte, Sandra Bullock, Angela Davis, Princess Diana, Barbara Eden, Roberta Flack, Lillian Gish, Melanie Griffith, Leona Helmsley, Joan of Arc, Caroline Kennedy, Jessica Lange, Viven Leigh, Jayne Mansfield, Marilyn Monroe, JonBenet Ramsey, Debbie Reynolds, Sally ride, Linda Ronstadt, vivian Sommerville, Brittney Spears, Uma Thurman, Kathleen Turner, and Joanne Woodward. Famous Aquarian Moon Men: Muhammad Ali, Woody Allen, Johann Sebastian Bach, Harry Belafonte, Peter Bodganovich, Mel Brooks, Marc Chagall, Chevy Chase, Dante, Henry Ford, Samuel Goldwyn, Cuba Gooding, Jr., John F.Kennedy, Jr., Timothy Leary, John Lennon, Nickolai Lenin, George Lucas, Bela Lugosi, Steve McQueen, Adolphe Menjou, Ogden Nash, Carl Orff, Mickey Rooney, George Segal, Christopher Walkins, Orson Welles, H. G. Wells, Gene Wilder and Tennesee Williams.